In a small but cosy camper van on a parking lot in Hellissandur, someone is making coffee. It’s close to dinnertime, the sun breaks through the clouds for the first time in a few days and illuminates the magical Snæfellsjökull glacier. There could be some beautiful light tonight. Einar Guðmann, Gyða Henningsdóttir, and their dog Kútur greet me warmly. They’ve been taking it easy today, not hurrying out of bed because during the summer season, they mostly work at night, when the light is the prettiest. Einar and Gyða met in their hometown of Akureyri in 2005 and quickly started working together on their joint interest: photography. “We dove into it together,” says Einar. “For the first year we were energetic enthusiasts but we soon decided to do this for real.” To begin with, they focused on birds. They became accomplished bird photographers and known for their photos but little by little, landscape photography took over. Einar had worked at the Environment Agency of Iceland for 14 years but resigned four years ago to focus on photography. Gyða, who had run everything from a fashion boutique to a fish processing plant, took the same step two years later. Since then, they pair has made a living from nature photography. 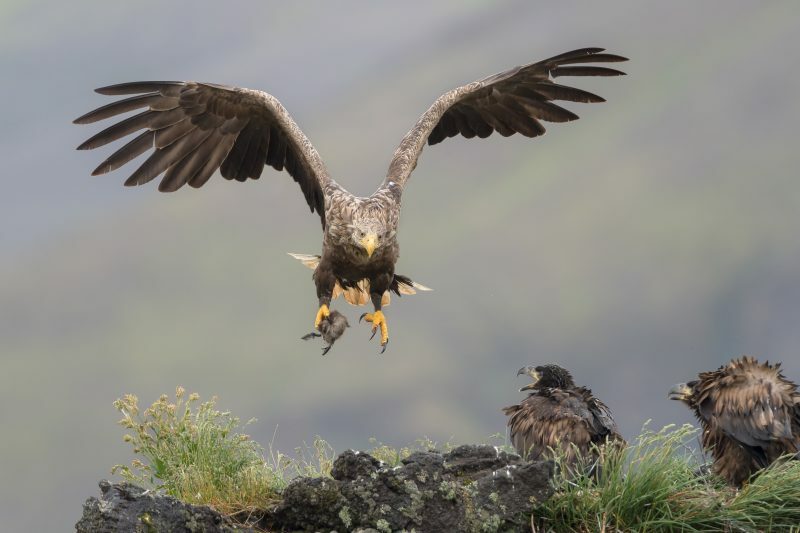 A white-tailed eagle returns to the nest with a duckling. Photo: Einar Guðmann/Gyða Henningsdóttir. “It feels a little like you never have to show up for work,” Einar says with a smile when asked about making his hobby his work. “Really, we work in the tourism industry. There’s a great need for beautiful promotional photos in that industry and many companies come to us. Originally, they might have heard that we have many great bird photos but our main source of income is landscape photos.” They travel around the country year-round to take photos, though summer is their busiest season. Last year, the two spent 78 nights in their car. “We try to split up our trips. Our goal this summer is to come home more often and take shorter trips. We’ve been spending two weeks or up to a month on each trip.” While in the past it was their children that drew them home, Gyða says, now it’s the promise of time with their grandchildren. “We’re like farmers. We need to gather hay in the barn over the summer while winter is spent on office work and editing our photos. The most boring thing about this work is working through all the material we’ve collected, which we do during winter. Lately we’ve been trying to break the monotony with shorter photography trips.” They don’t take as long trips in the winter, simply because of the weather, but their camper van is equipped with studded winter tires and can be used year-round. “We’ve woken up in snowdrifts up to 70cm (28in) deep with everything frozen,” says Gyða. The two say they have no need for a bigger jeep: 95% of their trips they can make in their camper. “And we also have two feet each,” Gyða adds with a smile. During the height of summer, Einar and Gyða drive between different parts of the country looking for the best light. Earlier this week, they were in the east but now, they’re at the westernmost part of Snæfellsnes. Einar says that they always take their time to get the conditions they’re looking for. “We try to be in one place until the light is as we want it. We usually don’t take a good photo without preparing it first. Getting the shapes and the light just right. On this trip, we’re on our fourth day trying to get a certain waterfall in a certain light. It’s a waterfall that’s very promising and pretty when it has enough water. It’s been cloudy and raining heavily but tonight, there should be just the right light for us to get a photo with the glacier in the background. The glacier hasn’t been visible except for one day, when the sky was white. A white waterfall against a white glacier under a white sky doesn’t work.” They agree that it can be stressful when things aren’t going well and their moods are affected by their work. “We’ve made some scientific experiments and found out that getting a good photo will keep you happy for at least 48 hours,” Einar says as Gyða grins. “But of course there’s pressure when we don’t get the photos we want. 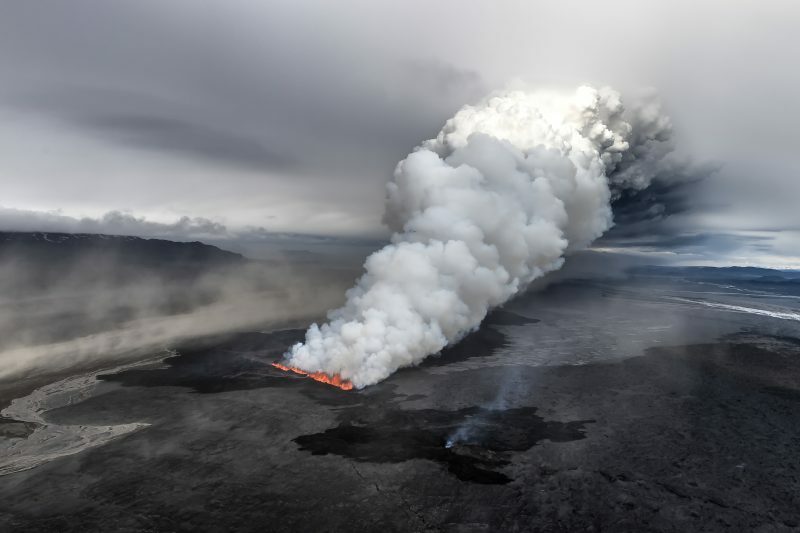 Eruption in Holuhraun, Iceland, September 1, 2014. Photo: Einar Guðmann/Gyða Henningsdóttir. “Yes!” Gyða exclaims when I ask if there’s competition between the couple about who gets the best photos each time. “The competition’s fierce,” Einar adds. “We usually joke that we’re competing for who gets the photo of the day.” “We live in this little space all summer so we need to keep each other happy.” Gyða adds. “We even try to find motifs for each other if the other person missed something. It’s incredible that even if we’re standing a metre apart, both with cameras shooting eleven frames per second, shooting the same scenes, our photos can be like day and night,” says Einar. Despite the competition, it looks easy for the couple to be happy for each other and encourage each other. One year ago, the duo published a book together titled Wild at Heart, printed in two different sizes. The book features both landscape and nature photographs with a caption by each photo. “It’s about Iceland as we see it.” Choosing which photos make it into a book can be difficult, but there was one rule the pair agreed couldn’t be broken: they would each have the same number of photographs in the book. It was easy enough for a pair that works side by side. “We’re together almost all the time,” says Einar. “It’s incredible that we haven’t become fed up with each other yet,” Gyða adds and they both laugh. text-align:start;widows: 2;-webkit-text-stroke-width: 0px;text-decoration-style: initial; text-decoration-color: initial;word-spacing:0px">10.0pt;font-family:"Arial",sans-serif;color:#333333">Subscribe here or preview our August-September 2018 issue in full.